Fashionable Design:Bring a lot of fantasy to your daily life.Wonderful Gift for everyone! Go Adventuring with Your Phone! ● Take your smart phone on all your ocean, mountain, river, or beach missions with this waterproof case. 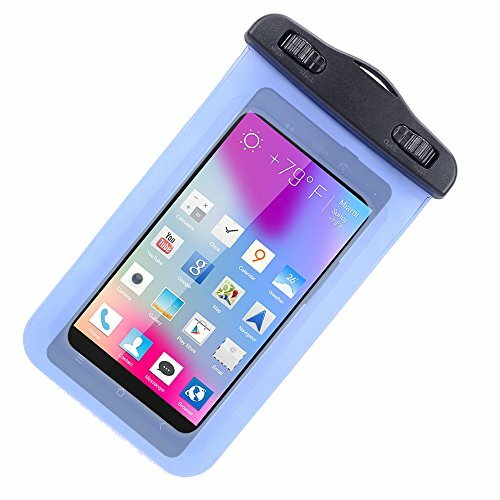 ● Offering full use of the device while safely sealed away, this case has a clear front and back so you can use all the touch screen functions including all camera functions. ● So if you want to check your emails or take amazing photos from the top of a snowy mountain or in the middle of the ocean - now you can! When you make full use of time to watch news in the kitchen or enjoy listening wonderful music in the bathroom,this waterproof case could protect your precious phone from splashing. You could also sing while watching MV on your device's screen in the bathroom without worrying it get wet or damage. + Feature light-weight,fully sealable-locked design,so in addition to protect your phone from water,bumps and scraches. + With included a lanyard,the case is the perfect accessory for on-the-go travel. Compatible With:Most popular phone up to 5.5 Inch.May not snugly fit all due to variations in the size of different models. Before using,please do the waterproof test and check whether there is damage,especial for the surrounding seal. If you in the market for a waterproof case but are on the fence,this would be your best choice. ✔Universal waterproof pouch design provides protection for Phone, ID, Credit Cards, Cash, and more from water damage. ✔Composed of a highly-durable thermoplastic polyurethane (TPU) material, which protects against water, dust, dirt, grease, scratches and bumps. ✔Innovative swivel lock design provides a user friendly experience when opening or sealing the pouch. ✔Ultra Clear-film material allows full touch screen access and button control functionality as well as the ability to take photos while the pouch is still equipped. ✔Comprehensive protection allows use in mud, water, snow, dirt, and grease. If you have any questions about this product by SumacLife, contact us by completing and submitting the form below. If you are looking for a specif part number, please include it with your message.